Based on innovative ‘data mining’ techniques and combined with Full Blood Count, the Malaria suspicion flag is optionally available on both the ABX Pentra XL 80 and Pentra XLR. “In 2016, 91 countries reported a total of 216 million cases of malaria, an increase of 5 million cases over the previous year. The global tally of malaria deaths reached 445 000 deaths, about the same number reported in 2015. The proportion of febrile children presenting for treatment is mainly taking place in Public Health facilities (from 2013-2015, 35-50 % febrile children presented in sub-Saharan Africa countries). With a clinical sensitivity and specificity reaching 80% data results performed on P. vivax and P. falciparum, the Malaria flag of HORIBA Medical delivers a Suspicion Malaria Infection screening provided on routine use on hematology analyzers. It is combined with the hematology Whole Blood Count and not a separate test with additional costs. This Suspicion Malaria flag is generated by a complex algorithm using the “data mining” technique based on the analysis of many analytical variables of the complete hemogram and not only variables of the automated formula. The Malaria flag is used as a screening test and invites the biologist to implement the usual laboratory techniques for the diagnosis of malaria. 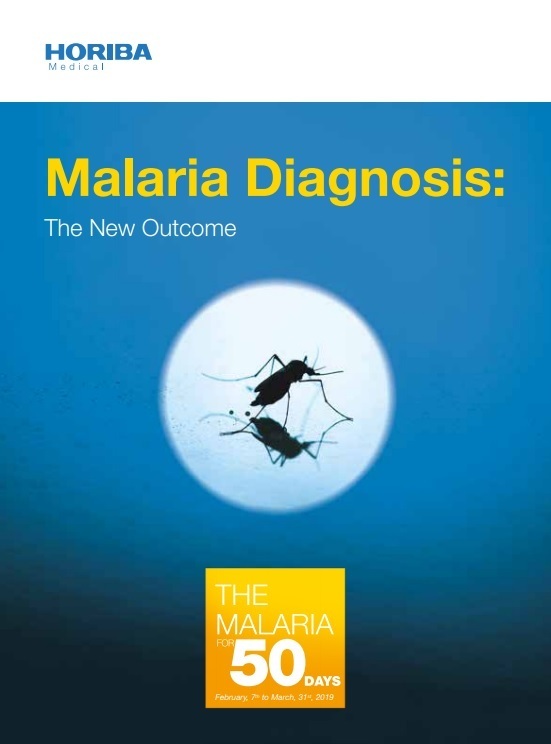 Malaria-endemic regions are usually economically challenged and extremely cost conscious, where accessible, dependable diagnostic methods are urgently needed. The Suspicion Malaria Flag option2 is available on ABX Pentra XL 80 and Pentra XLR range and, hence, offers a cost effective and fast malaria screening. Since complete blood count (CBC) and leukocyte differential count (DIF) are the basic, most common tests in clinical laboratories, hematology analyzers that can screen for the presence of malaria parasites are a great boon for both potentially malaria-infected patients and today's busy diagnostic labs. HORIBA hematology systems combine micro sampling, efficiency, robust technology, intuitive software with the great advantage of high throughput (rapid one-minute whole blood testing) at costs lower than other methods, such as microscopic examination. With this new flag, HORIBA Medical aims to contribute to tomorrow’s health for a Malaria free world. The ABX Pentra XL 80 and Pentra XLR are reliable and compact 5 part DIFF hematology analyzers. The Pentra XLR incorporates full reticulocyte parameters to facilitate the investigation and diagnosis of haemopoiesis and anemia. As the latest addition to the Pentra family, this analyzer brings HORIBA’s gold standard reticulocyte technology with STAT capabilities to a smaller platform. This makes it ideal for space-restricted laboratories or those with a smaller workload that do not want to compromise on quality. This reliable, easy-to-use analyzer with integrated PC eliminates manual methods to enhance laboratory productivity. Furthermore, the ABX Pentra XL 80 and Pentra XLR’s large capacity auto-loader and ability to process 80 samples per hour, combined with auto rerun, Customized Dilution Ratio (CDR) and automatic validation, all enable a hands-off approach. This means users can dedicate their valuable time to results analysis and more specialized investigations. Providing a high degree of flexibility, the ABX Pentra XL80 and Pentra XLR has a microsampling system requiring only 53µl of blood for FBC and 35µl for full reticulocyte analysis making it ideal for pediatric or other small samples. On the Pentra XLR, the reticulocyte channel utilizes Thiazole Orange technology, providing a full maturity profile in addition to a highly accurate reticulocyte count. It is also compatible with ABX Pentra ML data management, facilitating simple integration into existing systems. The Pentra XLR is built on the same proven reticulocyte technology as HORIBA’s higher throughput Pentra analyzers, ensuring quality and full compatibility of results and reagents. With three quality control levels for all parameters, the ABX Pentra XL 80 and Pentra XLR are robust and reliable platforms, which also provides complete data traceability on-board and integrated validation to ensure total peace of mind for the user. The ABX Pentra XL80 and Pentra XLR series enhances laboratory productivity, flexibility and quality, adding value to any hematology laboratory. 1 WHO (World Health Organization) 2017 report and http://www.who.int/malaria/areas/diagnosis/en/ sources. 2 Malaria Flag is optionally available on ABX Pentra XL 80 and Pentra XLR for worldwide users except USA under FDA registration.